Wow….I missed doing this last week! We were on Spring Break in Atlanta, Georgia. I am now back in chilly Ohio, but keep wanting to say “y’all” instead of “you all”. LOL! I feel like maybe if I keep talking like I am in the South, it will feel like I am in the South too! Okay, wishful thinking. Busy week ahead. Jon gets spacers in for his braces. Braces go on a week from tomorrow. Hannah has a play this week that she is in. Skating, normal busy stuff. You know. The fridge is full, though, and I am ready for the week. Chocolate something….I am craving chocolate & coconut, so maybe some chocolate macaroons. MMMMMMM! Asparagus Thin is hosting this week’s GF menu swap. Rice is the ingredient theme. I have planned to use rice at least twice this week. The brown rice with the salmon will be a short grain rice, which is my favorite. I like that it is a little chewier than the long grain versions. For my Mexican rice, I usually use a brown basmati (I get it at Trader Joe’s) or brown jasmine (same, Trader Joe’s). I always use my rice leftovers for lunch either topping with black beans & cheese or sauteeing up some fresh veggies in sesame oil and tossing them together. YUM! I LOVE rice! I would also like to try making my own rice pudding, so I think I am going to add that to my list of “Baked Goods” this week, even though it technically isn’t “baked”. Also, don’t forget to check out Orgjunkie for lots more menu plans. I have always, always been hesitant to try a new restaurant since I have been on the gluten-free diet. I am afraid of getting sick. At first, I didn’t seem to react all that badly, but now, it is horrible. I won’t gross you out with the details, just know that it is not pretty or fun. So I usually stick with chain restaurants (yes, they get boring, but when you have to follow a strict diet, what do you do?) and those who have gluten-free menus. 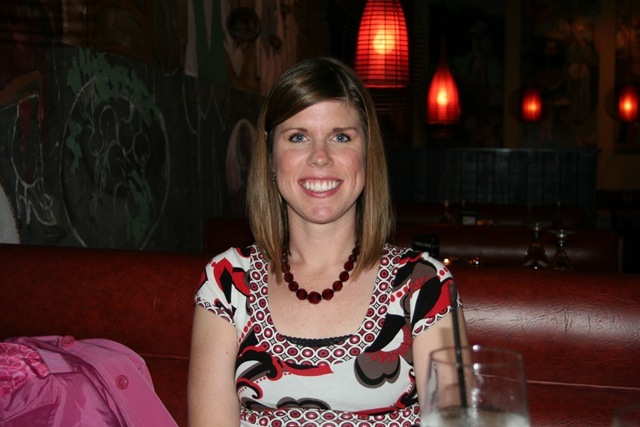 I have ventured out to other restaurants and do so much more often now that I have been gluten-free for over 3 years. I feel more comfortable expressing my needs and reading the reactions of the employees (servers, managers & chefs/cooks) that I am trying to educate. Last year when I was in Atlanta over Spring Break, my sister took my Mother & I to a wonderful place called Aqua Terra Bistro in Buford, Georgia. I was nervous, I didn’t see anything on the web site about a gluten-free menu. I asked to speak with the manager upon sitting down and for some reason I started my questions/statements with “I have Celiac Disease and have to follow a gluten-free diet….”. I never start out saying I have Celiac because most people look at me like they have no clue what I am talking about or like I have 2 heads. Well, much to my surprise, she informed me that the chef’s wife also had Celiac disease! WOW! They would indeed be able to accommodate me. We had a fabulous meal. I can’t even begin to express how amazing this meal was. The salad is one of the best I have ever had and I eat a lot of salads. Wonderful flavors that all compliment one another so nicely. The polenta was to-die-for! The smoked gouda flavor really made this dish. I love polenta plain, but this flavor brought it to a whole new level. 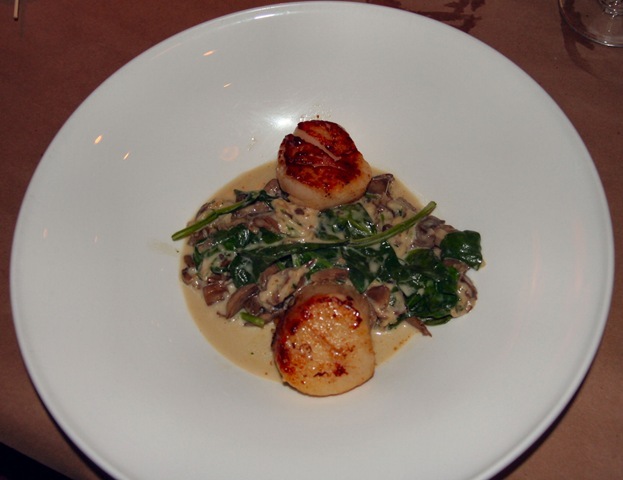 The scallops were done perfectly and the spinach with exotic mushrooms & truffle cream sauce left me speechless. I wanted to clean my plate, but had to save room for the dessert. The creme brulee was amazing. Creamy and decadent. Perfect. I give this restaurant 5 stars and all my thumbs up. Really, if you ever get the chance to eat there, GO! You won’t be sorry! I know it seems as if I have been “missing in action” this week. Well, I have been, somewhat. I am on Spring Break! YAY! We have been having a wonderful time in Atlanta, Georgia! Warm & sunny, up until today. Still, I’ll take rain & warmer temps. We had a successful road trip down. We packed all of our food so that we didn’t have to eat on the road. Then at lunch time, we pulled into a McD’s parking lot and had a picnic in the car (all the rest areas were closed along I-75 in the area for some reason). We ate at Chili’s Too on Tuesday. I had never seen a Chili’s Too, I guess this is the scaled down mall version. They did have a GF menu. They seemed very helpful, however, I got glutened. 😦 Jon didn’t, so that was a plus, especially since he was just coming off having the stomach flu the day before (there was no doubt that he had the flu, as Hannah, I and the little girl I watch all had some version of it). I was bummed that I was glutened. I won’t eat at Chili’s Too again, but may still try Chili’s back h0me down the road. Last night my sister, Mom and I ate at an amazing local place called Aqua Terra. I have lots of fun details & pics from this dinner, so I will post in a separate blog posting. We are heading home on Saturday. I will be sad to leave, but happy to be back to our routine. I missed doing my menu planning this week and reading all the blogs. I have lots to catch up on! I really can’t say enough good stuff about this company. First, I love that they make gluten-free oats for those of us who can’t enjoy traditional oats due to gluten issues. Second, they were nice enough to send me some products to sample. With those products I received some recipes and there was one that was just screaming my name. That and the over-ripe bananas sitting on my counter. 😉 There are actually several recipes that I am aching to try, but this one for the Banana Crunch Cake came first. It is a coffee cake. YUM! 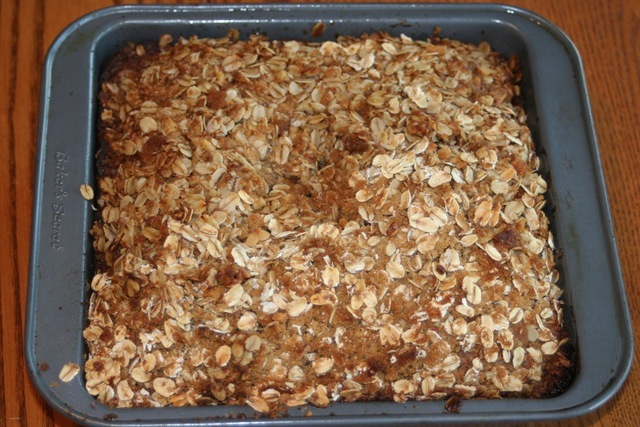 Mix oats, brown sugar, nuts and softened butter in a bowl for topping & set aside. Cream shortening and sugar until fluffy. Mix in mashed banana, eggs & vanilla. Add flour, salt, soda & nuts, stir until all ingredients are mixed together. Don’t over mix. Pour into a greased 8 x 8 inch pan. 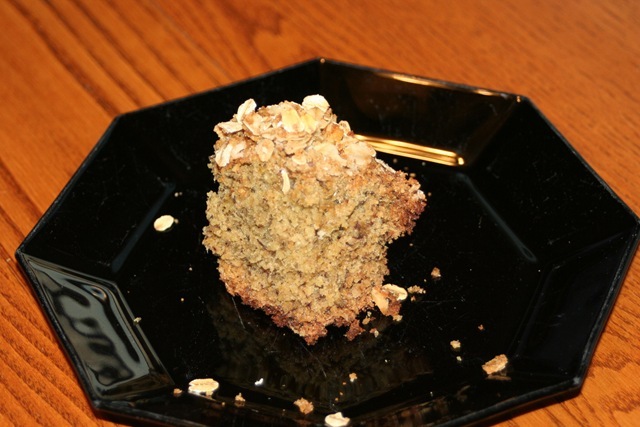 Sprinkle Oat Crunch Topping on the cake batter. Bake for 35 – 40 minutes at 350. Cool in pan on wire rack. So, I am thinking that we won’t be going hungry! LOL! I plan to stock up on bottled water at Wal-mart before we leave as well to avoid having to buy water on the road. Too pricey. I will also pack Capri-Sun for the kids. Once we are in Atlanta, we should be fine. Kroger is close by to my sister and they have the basics and I will have the bread. I am brining my cheap $10 toaster with us so that I don’t have to worry about CC with my sister’s stuff. It is small and easy to bring along. I am hoping this helps to avoid the stops at McD’s/Wendy’s & the like on the way down & back. We have depended on those places in the past, but it is much easier not too and you don’t have to wait to eat if you can’t find anything that you can eat….HUGE, when you are out in the middle of no where. Okay, so maybe it is “Menu Plan Sunday”, whatever. This week is the last week before we leave for Spring Break! YIPPEE! Actually, it isn’t even really a full week. We leave on Friday after the kids get out of school. Aaron will be staying home, holding down the fort,making sure the house is okay. 😉 LOL! 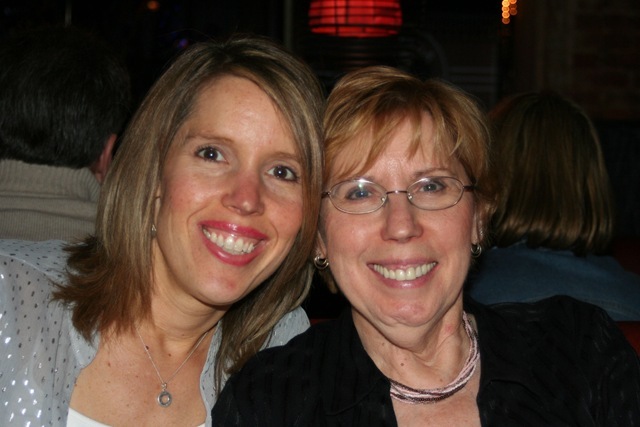 The kids, my Mom & I will be visiting my sister, BIL and nephew in Atlanta! I am so excited, as are the kids. Getting ready and packing this week is going to take precedence over cooking and baking. I will be baking 2 loaves of bread to take with us (for Jon & I), brownies and maybe some carob fudge, too. I have the coconut pumpkin muffins in the freezer from last week to snack on as well and some thumbprint cookies from Christmas frozen to take as well. There will be no shortage of treats. Watch for my post on traveling & adhering to the gluten-free diet. Five Dollar Dinners is hosting this week’s menu swap! Book of Yum is hosting this week’s GF Menu Swap.